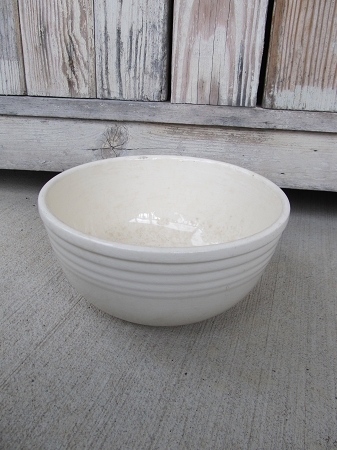 Antique Vintage Sevilla Pottery Stoneware White Oven Bake Mixing Bowl. I did a little research on this bowl and found it's history pretty interesting. There is a debate on which company made these bowls, but the start date of these is about 1938. Bowl is bottom marked with Oven Bake. There is the exact bowl on the Sevilla brand web site that I found. 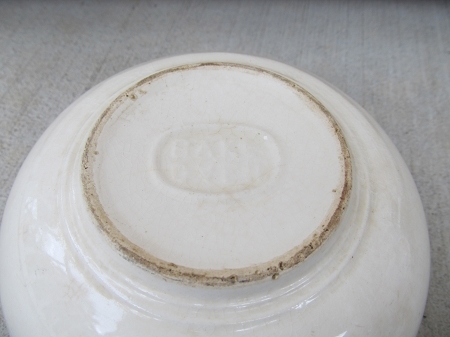 It has some glaze crazing and some light staining in the bottom from use, which is pretty much expected from age. No chips or cracks. Love stoneware bowls, of any kind!!! Perfect for that Farmhouse look!!! Size is 7 3/4" x 4" High. Fabulous bowl to add to a collection or start one! Here is a link to the page where I found the information, also shows what else was made by the company. I love learning the history of the pieces I collect too! www.laurelhollowpark.net.